Defiant, joyous and a live force to be reckoned with, New Orleans stalwarts The Hot 8 Brass Band will hit the Arts Club next week, Getintothis’ Josh McMahon books his place. 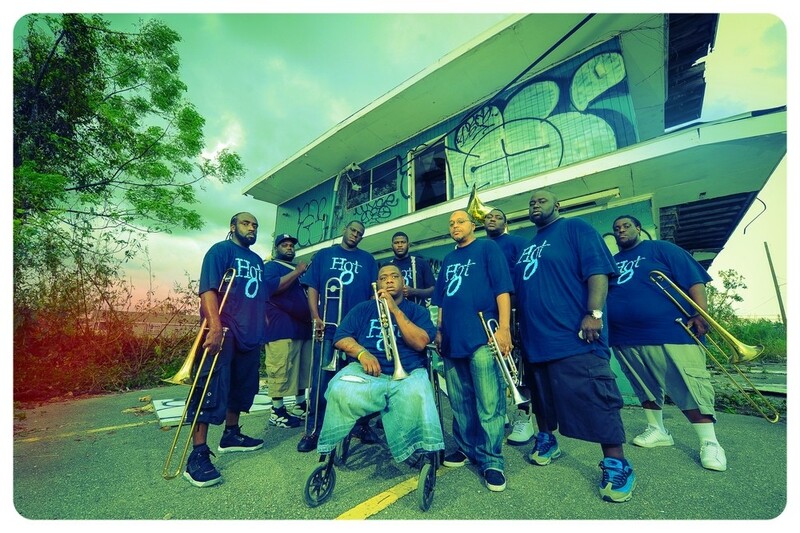 Battling through Hurricane Katrina and multiple member losses to the tragically real hands of gun violence, the defiant Hot 8 Brass Band lay their story bare for all to see and hear. Their evocative musical journey gives everyone an authentic insight into their lives, career and the true nitty-gritty of New Orleans. As if a new album celebrating their 20th anniversary wasn’t enough, the Grammy nominated band have compiled highlights of several of their albums, along with fresh new material for their tour Vicennial. The tour will include some of the band’s most celebrated work, from: The Life and Times Of…, Rock With The Hot 8, Tombstone and other musical gems. It’s not long since the party was last in Liverpool, the eight’s most recent Mersyside barnstormer 2014 raising the Anglican Cathedral’s roof even higher with a force of unadulterated joy. With the band’s repertoire including their own distinct take on the upbeat Sexual Healing and the more soulful We Shall Walk Through the Streets of the City, The Hot 8 Brass Band will not fail to bring the mardi gras feel to Liverpool’s Arts Club on November 9.